Santa's Magic Key [C6745] - $12.00 : Yarn Tree, Your wholesale source for cross stitch supplies. 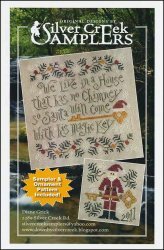 Cross stitch pattern by Silver Creek Samplers. Wreaths and a key accent the Christmas themed verse "We live in a house that has no chimney so Santa will come with his magic key." Stitch count 93 x 89.